Beef ball is a commonly cooked food in Canton and overseas Chinese communities which was originated by Teochew people. As the name suggests, the ball is made of beef that has been finely pulverized, other ground meat such as pork may be the ingredients of the beef balls. 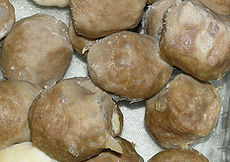 They are easily distinguishable from fish balls due to their darker color. Another characteristic is the tiny pieces of tendon in each ball will dissolve with prolonged cooking. ^ "Muslim workers in Hong Kong angry over 'tainted' meat". www.ucanews.com. Retrieved 13 May 2013. This page was last edited on 30 July 2018, at 13:21 (UTC).